RSVP are matched with the main card colors. 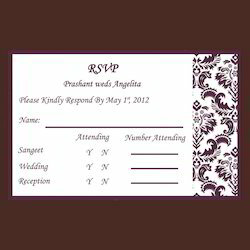 Additional RSVP cards can be order as per your occasion. Approximate Width : 5.5 cm Height : 3.5 cm. Backed by profound experience of our experts, we are an unparalleled name engaged in providing high quality assortment of RSVP Card. 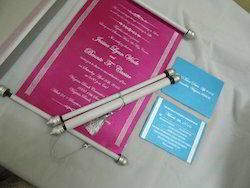 Offers unique Indian Wedding Invitations & Wedding Accessories at manufacturers' cost. Samples available for Bulk Orders!!! - Weight - 42 gm. We are involved in offering quality range of RSVP Wedding Cards. This is a one fold card in which the card has a single fold from the center. The details of the RSVP are mentioned on the inside of the fold. The envelope is plain and simple bearing the material texture same as that of the card.